If you’re looking for an authentic working farm atmosphere to host your special occasion, Gate Street Barn is unique in providing just that! A beautifully landscaped scenic environment with views over an organic working farm and a grazing herd of Longhorn cattle. Amazingly, you won’t have to travel to an isolated location to find this hidden gem, as this venue is conveniently situated five miles south of Guildford, a market town in the heartland of Surrey. What more could you possibly wish for? 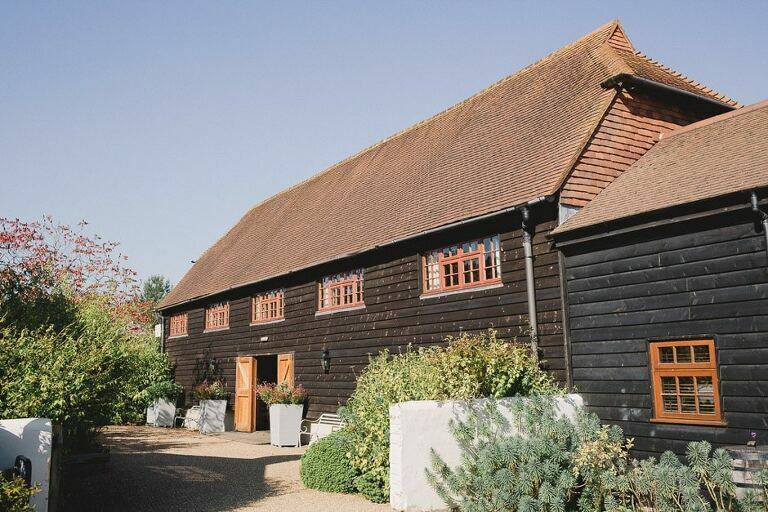 The main barn seats up to 130 guests and is licensed to hold civil ceremonies and is also perfect for receptions and evening entertainment. This function area is extremely versatile. Its sheer length lends itself ideally to dramatic banqueting style catering, yet can equally create a romantic personal feel through using a grouping of smaller sized circular tables. The barns are naturally bright and airy, but windows and bi-fold doors can be opened to allow for more daylight or create a romantic evening mood with dimmers and candlelight torch effects. The venue gives you free reign to place your individual stamp on the surroundings and transform your ideas and dreams into reality. Adjacent to the venue, the site provides elegant accommodation for family and close friends of your wedding party and has something to suit all needs. The luxurious Farmhouse contains seven double bedrooms with en suite facilities, the Stable House, sleeps up to six people and is a self-contained unit with two bedrooms and kitchen facilities – perhaps suitable for elderly guests or families – and for those who may prefer a more glamorous style camping environment, there’s the more secluded Shepherd’s Hut and Hayloft. Both of these are suitable for two guests, and provide basic overnight accommodation. Warm, inviting, cosy and with an English country garden vibe, Gate Street Barn is the perfect venue for all weathers. Winter wood burners convey a cosy, romantic mood whilst summer gives opportunity to relax and enjoy the beautiful outdoor scenery with outdoor refreshments, extra space to mingle with guests and of course capture those significant moments with stunning photography. If you’d like to enquire about my availability for Gate Street Barn please get in touch here.